Just in time to help me figure out how (or if) to use my kayak paddle with my bicycle, Claire arrived at Gasworks Park, ready to ride, sans paddle. It had been so long off the bike for me that I wasn't quite sure I was all together, yet I trusted her advice that it was unnecessary. This ride was unlike any of the others I had led- there were some qualifying factors to allow participants. For example, Claire is currently receiving chemotherapy for breast cancer - an instant qualifier. Next, Trina arrived, noting she had only been on one COGS ride since joining and didn't even feel worthy of the Holiday Party, yet here she was. When Mark B arrived, I barely recognized him, since I'd never seen him on his bike (we don't normally ride in the same circles). Then there were the posers, the fakers, the wannabe easy riders, the I-didn't-have-anything-else-to-do-today riders like David and Michael who think they are out of shape, yet they have merely been taking some off-bike rest time, laying in wait for their next hill-fest or century. And although cause for suspicion, they agreed to help with flats, repairs and locating pie at the market so I welcomed them to the group. We headed north on the trail through the UW campus and managed to make every light, an unusual occurrence. 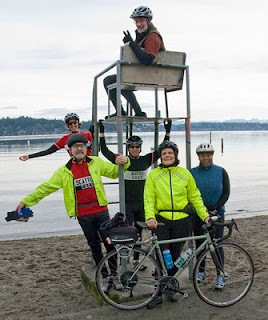 The plan was to ride to Magnuson Park but when we made it to 65th St, the turn-off point, I felt so good and everyone else said they would like to continue. There was a sudden rise in chatter and I saw that Eric had caught up with us. 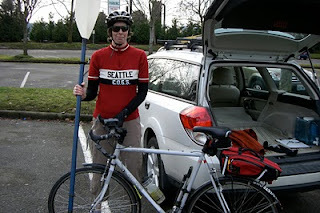 He had ridden over from his house in West Seattle and is an easy-going guy (and photographer) so he fit in just fine. We rode into Matthews Beach Park and I must not have been the only one with some endorphin production because suddenly everyone became a little silly. Good thing Eric was there to capture it on film. I think we were good subjects and the weather provided us with a great backdrop of the Cascades. Soon, it was time to leave, regaining the little hill that we had descended to the water and heading back to Gasworks and on to Ballard. Although the Burke-Gilman is a flat trail, there are some subtle ups and downs and heading south from 65th St is one of those downs. So I was just going too fast to figure out who the guy in blue coming toward us was. But, sure enough, he joined the group and I realized it was Bruce. OK, so by now you might be thinking that there are an awful lot of guys on this easy ride. Don't these kind of dilly-dally rides usually attract women more than they do guys? 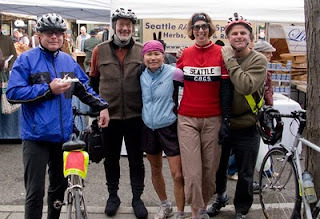 Well, this is the COGS group and, though it officially stands for Cyclists Of Greater Seattle, the vast majority of us (guys included) know it as Creepy Old Guys in Spandex. Of course, they are nice! creepy old guys, otherwise we'd lose them somewhere along the way. And off we went to the Ballard Farmers Market, in search of treats. I just read this and there was nothing particularly slanderous. It was a really fun ride. Great people and the weather has been amazingly warm. I'm now calling it FAUX-SPRING.